The new work, unveiled on Thursday, was made possible with the support of the Clore Duffield Foundation. 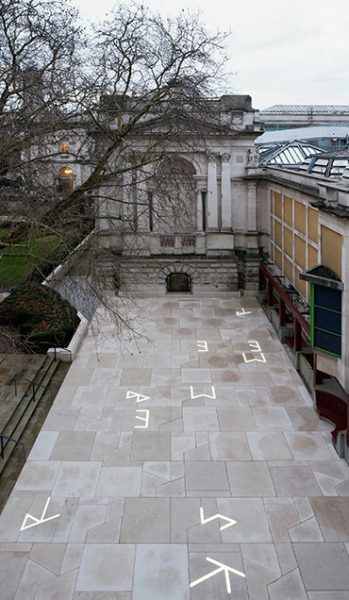 It consists of a newly paved terrace into which the words ‘Remembered Skies’ have been spelt out in illuminated letters, situated between the Clore Gallery – the home of JMW Turner’s paintings – and the Clore Centre for school visits to Tate Britain. Martin Boyce is best known for his atmospheric installations recalling archetypal 20th-century landscapes, such as the urban park, the abandoned garden and the corporate lobby, as well as modernist interior motifs and objects like fireplaces and lamps. Many of his works incorporate text, written in an angular typeface developed from a repeat pattern designed by the artist and based on the geometric shape of four concrete trees created by the modernist sculptors Jan and Joe Martel in 1925. Talking about the development of this new commission, Martin Boyce said: ’The phrase Remembered Skies came about through Turner’s paintings. While watching a documentary on Turner the question of composition was raised and how Turner would at times construct his compositions by moving mountains, repositioning trees and the framing of buildings. For his skies, the constant changing conditions of clouds and light would necessitate a composite of the seen, imagined and remembered’.